New release drives immediate digital transformation, automatic complication and cost savings for Dynamics 365 users moving communications to the cloud. 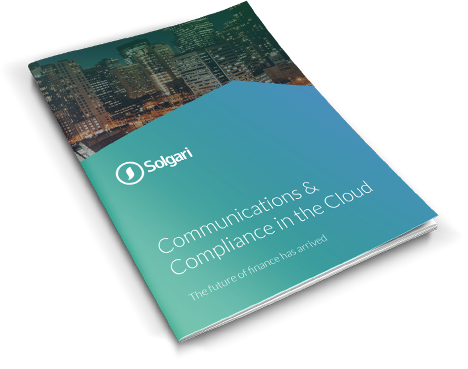 LAS VEGAS/LONDON – 17th July 2018 –Solgari, is a Microsoft ISV that provides a compliant, integrated omni-channel cloud communications solution, driving instant digital transformation, automatic compliance & certain cost savings. 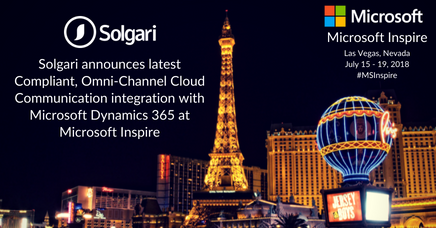 Solgari is today announcing at Microsoft Inspire, the global partner event, the latest version of the solution integration with Microsoft Dynamics 365. Solgari partners with global Dynamics 365 partners including OnDemand4U in DACH, Hitachi Solutions in UK, IBIZ Consulting Services in Asia Pacific and Oakton in Australia. As the adoption of Dynamics 365 continues to grow at over 75% quarter on quarter, unique SaaS applications such as Solgari add high value add to those customers and partners committed to creating competitive advantages, particularly around Digital Transformation, on Microsoft’s cloud. Digital Transformation: Offer customers all the modern communication channels, automatically identify each inbound customer or prospect and allow sales and support agents to handle each channel equally from Dynamics 365. Automatic Compliance: Record & Archive all the customer interactions across each communication channel within military grade cloud environment, allowing instant search & retrieval. Single Data View: All communication channels are integrated providing a single reporting & analysis view across all customer interactions. Certain Cost Savings: At least 50% savings with a per user per month SaaS model vs the alternative of multiple vendors typically used to try and achieve the above. Inbound Communications: Pop Dynamics 365 for all inbound calls, WebRTC, chat & SMS using integration between Solgari Communicator & Dynamics 365. Automatic Identification: Options to identify inbound communication based on phone, ticket, account or SMS number as well as chat & video interaction from the specific IP address. Outbound Communications: Click to dial, one to one or bulk SMS, launch WebRTC video for face to face meetings using Solgari Connect, all from Dynamics 365. Records: Leave record of communication within Dynamics 365 once the interaction has been ended. URL within Dynamics 365 case note which will provide access to recording of voice, video, chat or SMS interaction within Solgari User Application Suite. Launch of Solgari Communicator omni-channel as a browser-based service on AppSource.